There are many of these up and down Market Street this summer. 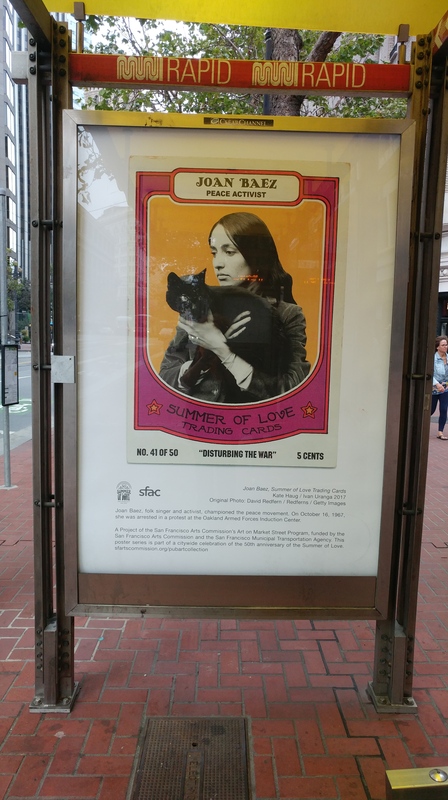 Joan Baez, a Northern Californians’ girlhood heroine–My mom bought a guitar and tried her hand at singing like Joan. I remember being very young and listening to her albums, and Mom on her guitar. I gave the guitar to a boy I had a crush on in my 20’s. He turned out to be a disappointment, but I’m glad the guitar is out there somewhere in the music world. And Reverend Cecil Williams was a hero of mine when I was a child. Dad used to bring me to Glide Memorial church in the Tenderloin on Sundays in the early 1970’s. The vibe was amazing! Reverend Williams and his wife, Janice Mirikitani. I made Rev. Williams a woodburned and water-colored picture and he said he would hang it in his office! My childhood was full of many of the Bay Area culture heroes one hears of today as being a vital part of our local history. It is hard to believe it’s been 50 years since the famous Summer of Love, and here I am, 51, and full of great childhood memories of Bay Area good vibes, music, and an appreciation of social justice causes. Glad to be a Bay Area native. And glad to be a 5th generation San Franciscan!